This is a rooster with a lot of personality! Couper is painted with watercolor and acrylic over vintage letters and envelops from the 1950’s. He was inspired by a rooster a good friend and I met at the NC State Fair. So he has a special place in my heart. The painting measures 11″x14″ plus the framing. 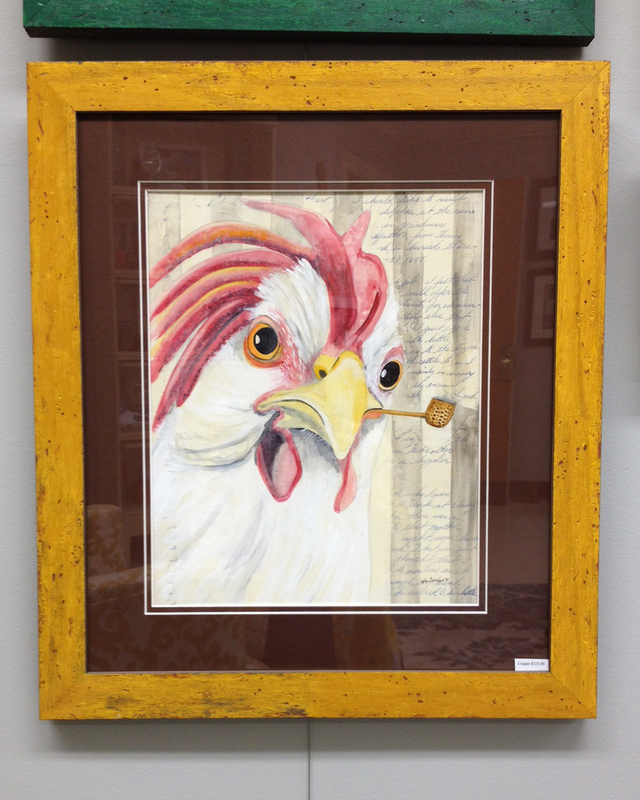 This piece has been custom framed by Lisa’s Custom Framing. The distressed yellow frame is one of my favorites plus I love how the yellows work together to set off his piercing eyes:) I think he would be a conversation starter no matter what room he hung in. $325.00 If you have any questions feel free to contact me at klc.crawford@gmail.com or come see him in person at 1220 Fort Bragg Rd, Suite 200B, Fayetteville NC.